Do not worry. Your someONE is here to help. 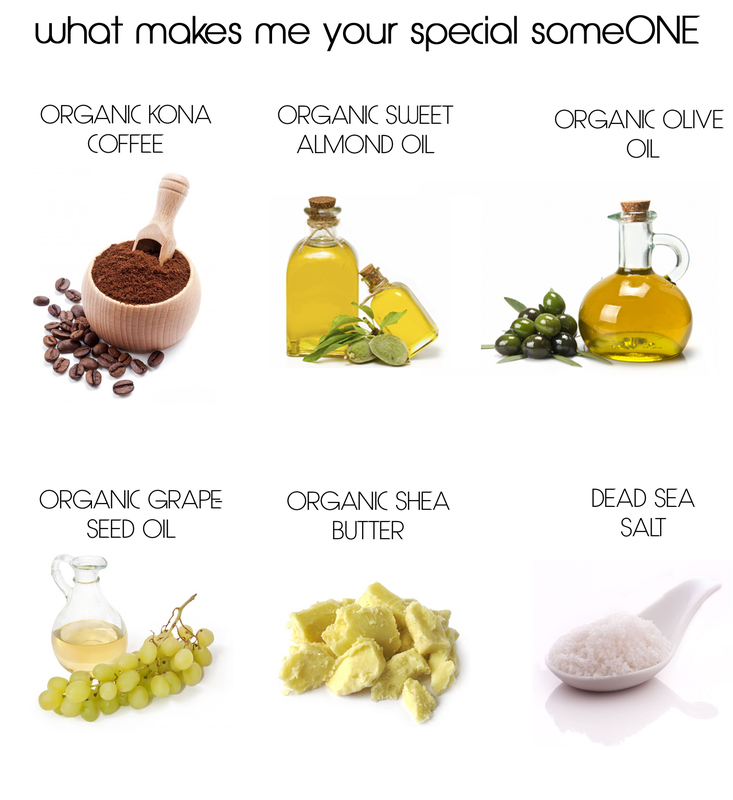 I’m someONE who will focus on stretch marks, cellulite, acne, psoriasis, varicose veins, eczema, and scarring with roasted and ground Kona coffee beans, Dead Sea salt and skin loving moisturizers. I’ll smooth your lumps and bumps, moisturize and tone your skin, and use vitamins & minerals to work wonders on your skin. I’m someONE tough enough to improve your skins imperfections, yet leaving you feeling softer and smoother than ever. I am someONE who is great for an overall deep clean. My original formula specializes in targeting cellulite and smoothing skin imperfections over time. How to use me. Im someONE who likes to start in the shower or tub. Get wet, rub a large handful of me in circular massage motions, focusing on problem areas. It’s OK to get dirty with me, while getting clean. Once you have massaged me gently onto your skin, give yourself a quick rinse. I've purchased similar products elsewhere and been disappointed. Also I've spent more money. I showed my wife that I got another for her, that night she tried it and was happy with this Scrub. Will be ordering more. I could not use enough of this coffee scrub. It made my skin, my legs so silky smooth. The smell is fantastic. Also improved the little dimples. First of all, I love the smell (probably because I am a coffee lover). It has a good texture as a scrub. You do not need much of it. I use it on my face and my legs. The skin is silky smooth. I like the results. OMG, my skin has never felt so soft. This has the perfect balance of coffee, sea salt, and oils. I'm currently testing another one and that one does not compare to this scrub. I love this one so much more. I will definitely be buying again once I run out. I've only used it a few times so I haven't noticed a different in cellulite, but my skin is so soft I think it's worth it. This left my skin feeling so smooth and it smells so good! Awesome product, smells great and I can see a difference in my skin appearance. I have purchased numerous items from this vendor and they are great. Love this body scrub. It makes my body feel alive after a warm shower. Can't wait to try other scents. Decadent Anti-Cellulite Coffee Scrub - 64 oz.